Intense underground steam explosions that occurred during the crater formation process could be responsible for the central depressions present in these ‘twin’ craters, located on Thaumasia Planum, an elevated plateau that lies immediately to the south of Valles Marineris, the largest canyon in the Solar System. 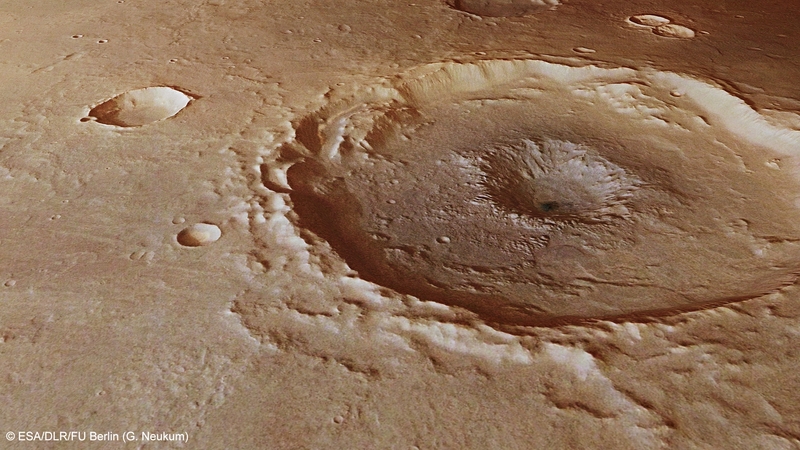 The images presented here were acquired by the High Resolution Stereo Camera (HRSC), operated by the German Aerospace Center (Deutsches Zentrum für Luft- und Raumfahrt; DLR), on board ESA’s Mars Express spacecraft on 4 January 2013. The northernmost (right) of the large craters in images 3, 4 and 5 was named Arima, after a town on the island of Trinidad, in 2012; the southernmost (left) crater is unnamed. Both are just over 50 kilometres across and exhibit complex interior features. The southernmost crater is also presented as a perspective view, revealing its interior characteristics in more detail. Several staggered terraces can be seen between the upper edge of the crater wall, which is over 2000 metres high, and the flat floor. This terracing is frequently observed in craters of this size; after the asteroid impact, the ejecta forming the crater rim, which may be several kilometres high, are unstable and sink along lines of weakness within the crater that are parallel to and concentric with the crater wall. When a large asteroid strikes the surface of a planet, much of its kinetic energy is transformed into thermal energy. Water or ice trapped below the surface is rapidly heated; this can lead to violent steam explosions that create a hole in the centre of the crater, where most of the impact energy is concentrated. As a result, the rocky surface is weakened and collapses into the resulting cavity, or may even be blasted away entirely, leaving a hole surrounded by rocky debris in its place. Although these two craters are similar in diameter, their central depressions differ in size and depth; this is most clearly evident in the false-colour topographic map (image 3). Perhaps more energy was delivered during the formation of the crater on the left, so that the subsurface ice was quickly evaporated, or more ice was present and caused an explosion of increased violence. 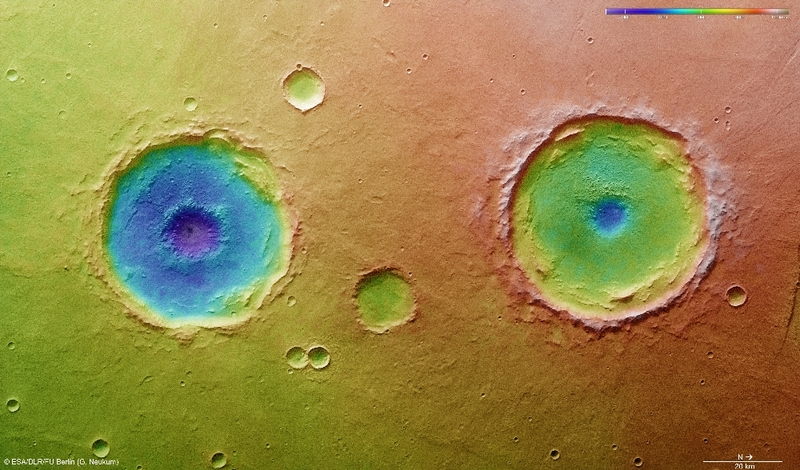 Many neighbouring smaller impact craters also reveal the presence of subsurface water or ice at the time of impact, as evidenced by their lobate rampart ejecta blankets. These debris deposits, which were excavated from the crater during its formation, have petal-like lobes around their edges. This feature results from the presence of liquid water in the ejected material, which allowed it to flow along the surface, thus giving the ejecta blanket the appearance of having flowed. 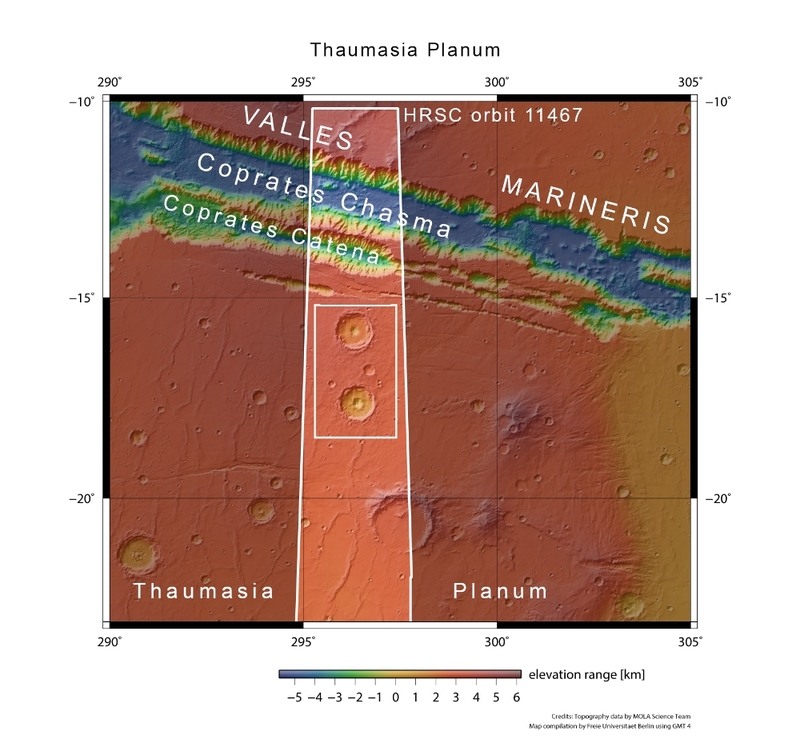 Impact craters like these offer windows into the past, in this case providing evidence for the Thaumasia Planum region having once hosted plentiful subsurface water or ice that was liberated during both small and large impact events. The images were acquired by the HRSC during Mars Express Orbit 11467. The image resolution is 25 metres per pixel. 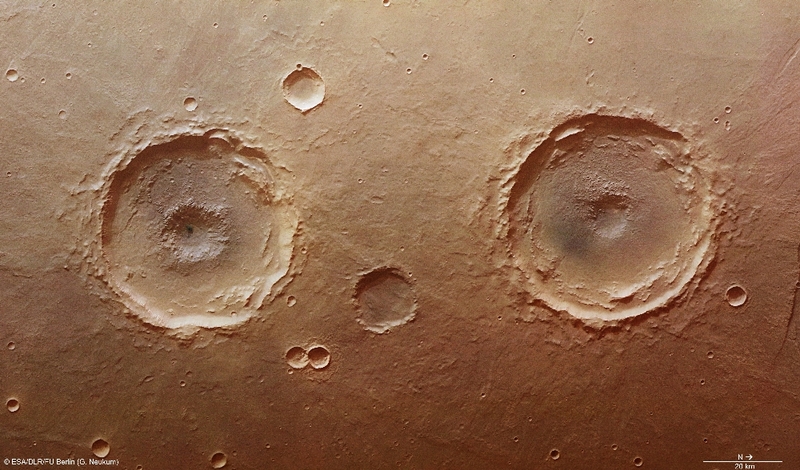 The colour image (4) was captured using the nadir channel, which is directed vertically down onto the surface of Mars, and the colour channels of the HRSC; the perspective oblique view (1) were computed from data acquired by the HRSC stereo channels. The anaglyph image (5), which creates a three-dimensional impression of the landscape when viewed with red/blue or red/green glasses, was derived from the nadir channel and one stereo channel. The aerial view, encoded in rainbow colours (3), is based on a digital terrain model of the region, from which the topography of the landscape can be derived.